They are fuzzy, small and nocturnal, and they mostly sleep all day. So recognizing potential signs of illness in your Teddy Bear hamster can be difficult. If you suspect your little guy might not be feeling up to snuff, observe his appearance and habits carefully, and call your veterinarian if you notice any signs of illness. Because of their long coats, Teddy Bear hamsters are extremely susceptible to wet tail disease, or "proliferative ilaitis." The illness is caused by the Lawsonia intracellularis bacterium, which takes root in the intestines and leads to progressive symptoms, including: lack of appetite, lethargy, liquid or bloody diarrhea, dull coat and eyes, irritability, dehydration and a red, raw, sore-infested bottom. If left untreated, wet tail disease can cause death within 48 hours, so it is imperative your affected pet receives prompt treatment, which may include antibiotics, re-hydration and medication to stop the diarrhea. Just like humans, Teddy Bear hamsters may lose the ability to create insulin and metabolize sugars. Glucose can then back up into the bloodstream and cause a "high blood sugar" condition that strains the kidneys and other body organs. 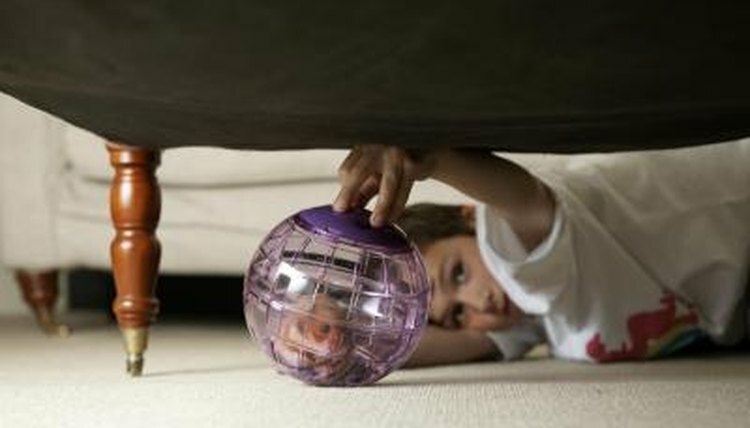 Symptoms of diabetes in hamsters include: excessive thirst, trembling, an unsteady gate, rapid heartbeat, lethargy, breathing difficulties, behavioral changes such as extreme irritability or unusual aggression, lack of coordination or even coma. Safeguard against diabetes and other illnesses by feeding your pet a healthy diet of high-quality hamster food, grains, hay and a small amount of fruits or vegetables each day. Keep "treats" to a minimum (no more than 10 percent of the daily diet), and make sure to provide plenty of fresh, clean water. When a Teddy Bear hamster eats foods contaminated with the salmonella bacteria, it may quickly develop an intestinal disease called "salmonellosis," characterized by symptoms that include rapid weight loss, vomiting, diarrhea or death. Because salmonellosis is transmittable to humans, it is important to always wash hands after handling your pet. Treatment includes antibiotics in the early stages of illness. Euthanasia may be necessary if the disease has progressed. Call the veterinarian if you notice that your hamster's urine is excessive or dark, or if you see signs of staining or blood in the bedding. These could be signs of a urinary tract disorder or bladder stones--crystalline formations that can block urea on its way to or from the kidneys. Other possible symptoms of bladder stones include difficulty in urinating, lack of appetite, lethargy or excessive thirst. If your pet is diagnosed with bladder stones, he may require surgery and may need a follow-up round of antibiotics to help clear any infection. The older your pet, the more at risk it may be of developing malignant or benign tumors, particularly if it is a female. Cancers involving the reproductive organs are common, as are those of the thyroid and adrenal glands. Symptoms to look for include hair loss, lumps and unusual behavior. External tumors are relatively easy for your veterinarian to surgically remove, but internal or glandular tumors may be inoperable. In extreme cases, your vet may suggest you euthanize the pet rather than allow it to suffer. Because of their long coats, Teddy Bear hamsters are extremely susceptible to wet tail disease, or "proliferative ilaitis." Safeguard against diabetes and other illnesses by feeding your pet a healthy diet of high-quality hamster food, grains, hay and a small amount of fruits or vegetables each day.